This is another simple but delicious grilled lamb chop recipe. Like the Grilled Provençal Lamb Chops it is traditional Southern French in flavors, but this can go with any grilled meal. Because so little goes into it, great, fresh raw ingredients are the most important part to making it perfect. I cook it over firewood embers in one of my fire pits here but you can cook it over any grill. If you use a gas or natural gas grill for this grilling recipe I suggest adding a smoker box with some smoking wood chips to add a nice wood smoke flavor to your chops. Lamb loin chops - This is basically the lamb equivalent to a T-bone steak. It has a small piece of the tenderloin (the smaller piece of meat) on one side of the "T". The other side, the top loin, is bigger. From a good butcher these should be nice, large and thick cut (2-1/2 to 3" thick). Also, they ideally should have the apron of the flank attached to it as pictured here (if not, it is not the end of the world). 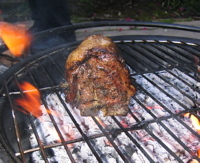 If you can find USDA Prime chops, your mouth will thank you as they are so tender and delicious! Finely chopped fresh oregano - Oregano is one herb which has a particular affinity to the flavor of lamb so I think it works well in this lamb chop recipe. You only need a couple pinches of herb for each chop you are making. However, you could substitute any combination of savory, thyme or oregano. Rosemary is great with lamb too and is featured in another lamb chop recipe, the Grilled Provençal Lamb Chops. A thick branch of fresh, wild rosemary - This is optional, but it really adds to the appearance and flavor. If you have your own rosemary bush, cut the brach low where it is thick and woody. Try to cut it at an angle to create a point for skewering. Remove excess fat from the chops except for the apron. Sprinkle all surfaces with chopped herb and then rub with olive oil to coat all the surfaces. Pull the apron around the filet (tenderloin) and as far around the lamb chop as it will reach. This will help insulate the filet and outer meat so that it doesn't burn to fast while the middle is still cooking. Skewer the apron in place with a small skewer or the branch of woody rosemary as pictured here. It helps if the rosemary branch is stiff and long. Remove the leaves from the branch from the sharp end up a few inches. If you have difficulty piercing the chop, you can first skewer it with a metal skewer which is removed and the rosemary branch is passed through the same trajectory. It may be difficult to pull it all the way through when it hits the leafy section of rosemary. 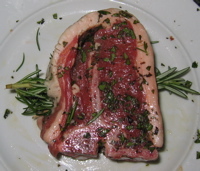 You can use a pliers to pull the rosemary through so that the entire portion within the lamb chop contains leaves. Cut off the excess branch on both sides of the chop. This lamb chop recipe can be prepared on any type of grill (including an indoor grill if neccessary) although I prefer a charcoal or wood fire grill or fire pit because of the nice smokey flavor it adds. Prepare a deep bed of hot coals. Season both sides of the chop with coarse salt and cracked black pepper. Start by cooking the sides over direct high heat to sear the chop, about 3 to 4 minutes per side. Continue cooking until your desired doneness balanced on its sides, rotating every few minutes. In particular, standing the chop on the flat bone side helps to insulate the meat so that it cooks slower and more evenly (as pictured). It can be left the longest duration in this position so that the other surfaces do not burn as the heart of the meat finishes cooking. At the end of cooking (about 20 to 30 minutes total including the initial searing), move to an area of lower heat off to the side of your grill or remove to a warmed plate and cover to rest for 5 to 10 minutes. That's it! Simply serve the chops and advise your guests to be careful for the rosemary skewer inside. Another delicious grilled lamb chop recipe that is easy to make! Done with this lamb chop recipe?